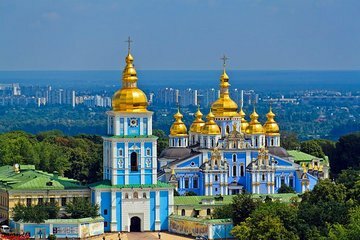 Get a comprehensive overview of Kiev on a private walking tour of this historic city. Discover major attractions such as Saint Sophia Cathedral and Saint Volodymyr's Cathedral as your private guide provides an informative introduction to the city. Meet your private guide at the Central Post Office to begin your walking tour. Learn about the 1,500-year history of the city since its founding and see landmarks including Old Kiev Hill, where the city started, and the Golden Gate, the ancient entrance to the fortified city. Peek inside the onion-dome roof of Saint Sophia Cathedral and note the Byzantine-era decor on the walls, and visit Saint Volodymyr's Cathedral, the top cathedral of the Ukrainian Orthodox Church. Your guide shares informative commentary on the history of Kiev and its present day attractions. After three hours, your tour ends near your starting point.